Your name will be showcased virtually on the Student Government Association website through the donor wall and on this crowdfunding page. Physically, your name will appear on a poster displayed at the commencement ceremonies. Quantities are limited; giving to this campaign is the ONLY way to get this pin! While anyone can contribute to the campaign, only current students will get this exclusive MSU Bear Head logo pin! Graduating senior for the class of 2019 can showcase their support of the Senior Class Gift by wearing the honorary donor graduation cord - a maroon and gold interwoven cord. This is the FIRST year of with this honor cord, so do not miss out! Quantities are limited! 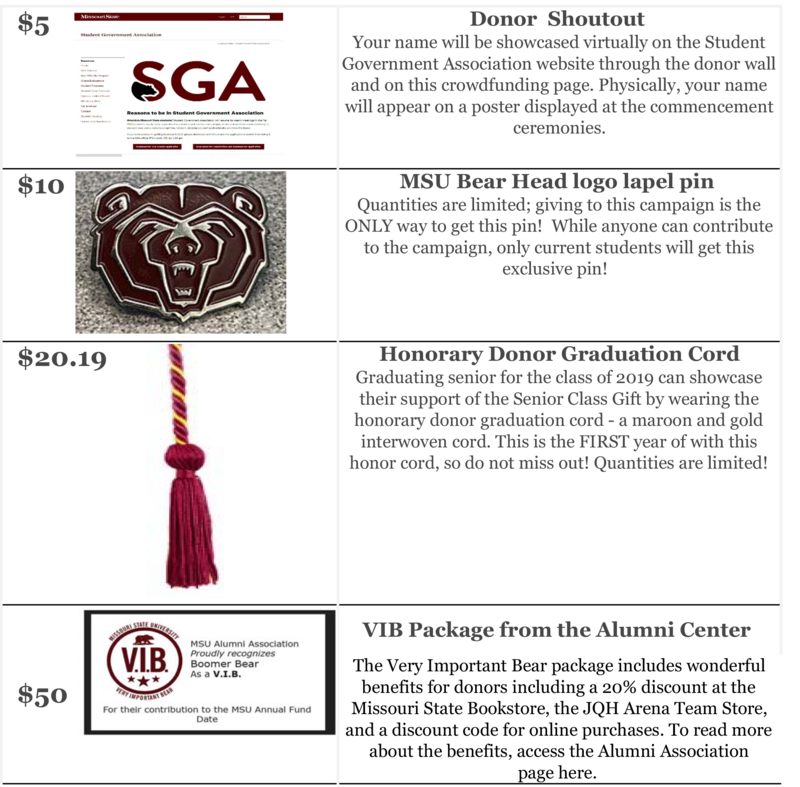 The Very Important Bear package includes wonderful benefits for donors including a 20% discount at the Missouri State Bookstore, the JQH Arena Team Store, and a discount code for online purchases. To read more about the benefits, access the Alumni Association page. Calling all 2019 graduating seniors! Here is your chance to add to your legacy at Missouri State University! By contributing to the senior class gift, you are making YOUR Missouri Statement through the gracious act of giving, a core tenet of the community service pillar of the Public Affairs Mission. Click the GIVE NOW button, select your incentive and enter your payment method. It is quick, easy and secure! After you’ve given to the campaign, encourage others to give by sharing this page on social media. Your VIB card will come in the mail after you have fulfilled your $50 commitment. Please allow up to two months of processing time and ensure we have the correct address on file. If you have questions on the campaign or incentives, please contact Senior Class President, Macy Hankel at mh2015@live.missouristate.edu. A transcript of this video is available for download here.